February average temperatures ranged from 4°F below normal to more than 6°F above normal. 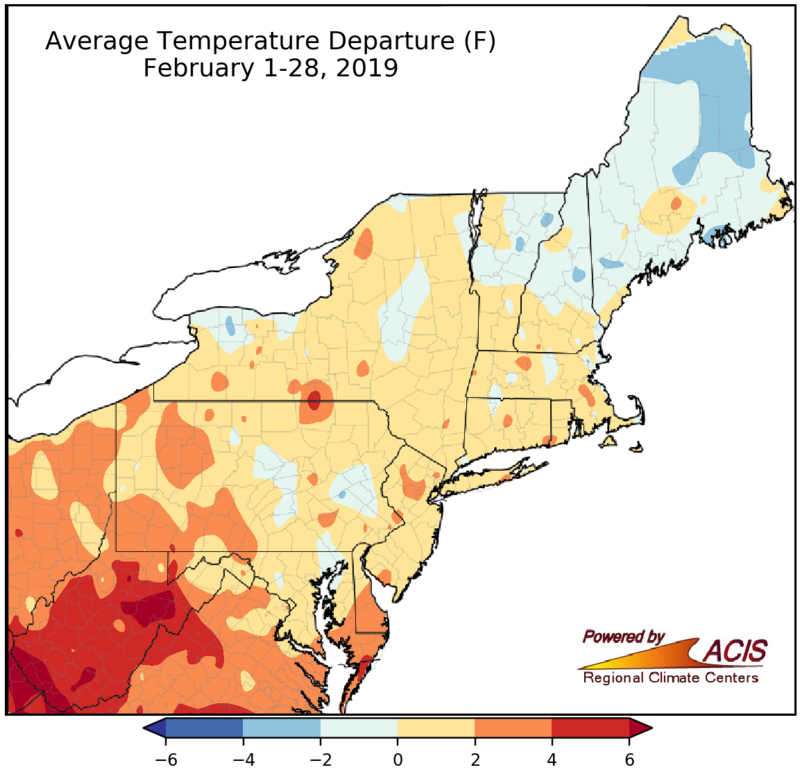 February average temperatures ranged from 4°F below normal to more than 6°F above normal, with much of the region wrapping up the month on the warm side. Average temperature departures generally transitioned from below normal in northern parts of the region to well above normal in the southwestern corner of the region, with northern Maine being the coldest area and West Virginia being the warmest area. Thirty-three of the 35 major climate sites experienced a warmer-than-normal February, with seven ranking this February among their 20 warmest on record. Seven major climate sites ranked this February among their 20 warmest on record. 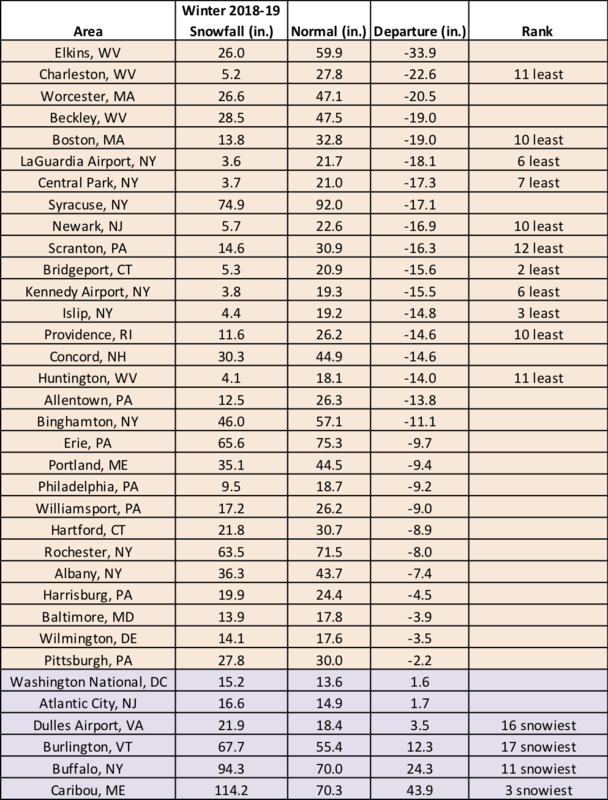 Winter average temperatures ranged from 2°F below normal to more than 3°F above normal. 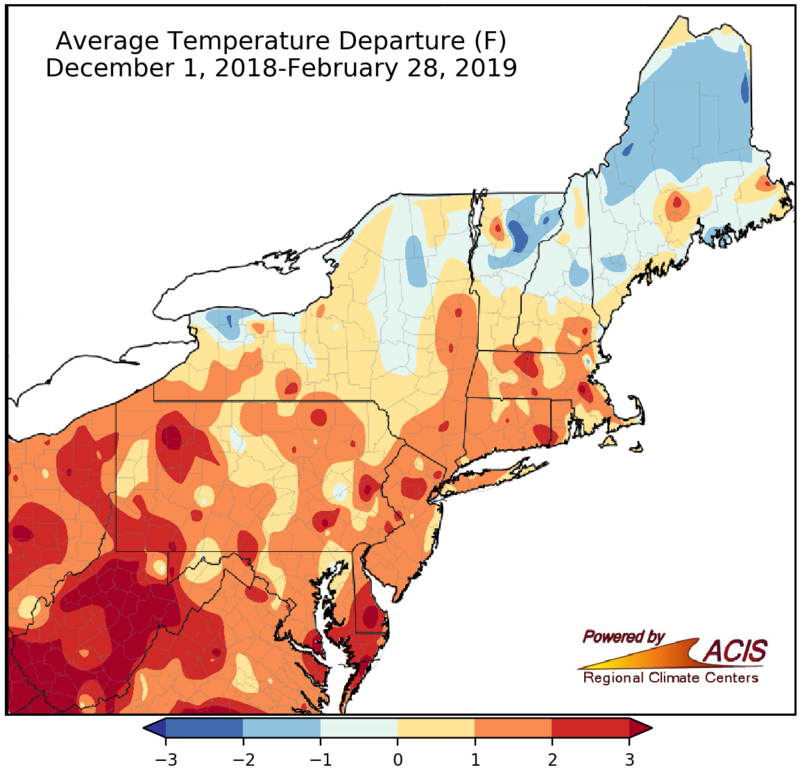 Winter average temperatures followed a similar pattern, transitioning from below normal in northern New England to well above normal in West Virginia. Overall, average temperatures ranged from 2°F below normal to more than 3°F above normal, with many areas being warmer than normal. Thirty-two major climate sites were warmer than normal, with eight ranking this winter among their 20 warmest on record. Eight major climate sites ranked this winter among their 20 warmest on record. February precipitation ranged from 50% of normal to more than 200% of normal. 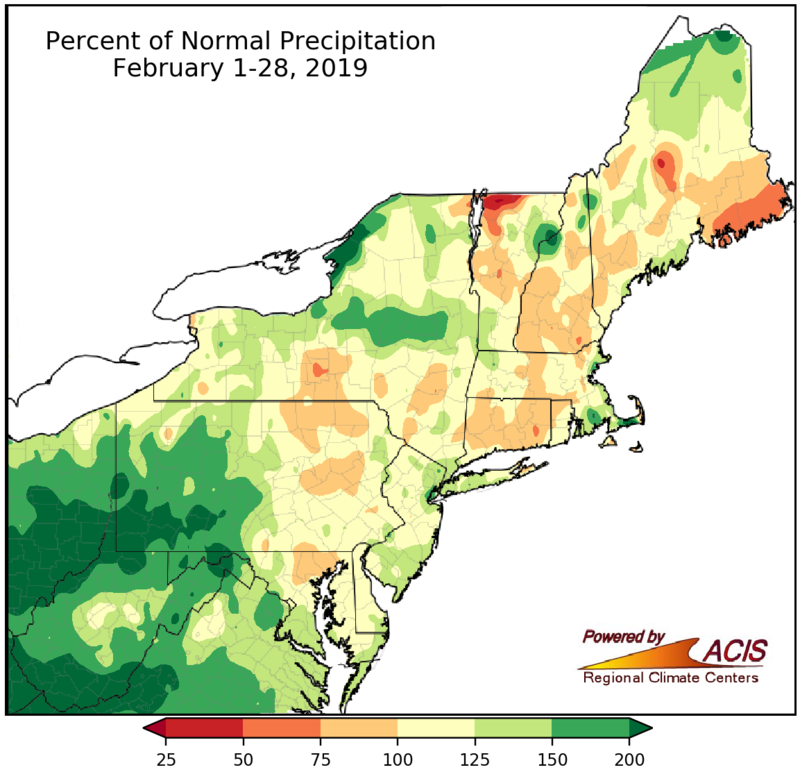 February precipitation ranged from 50% of normal in parts of northern New England to more than 200% of normal in parts of West Virginia, western Pennsylvania, western Maryland, and northern New York. As for the 35 major climate sites, 34 were wetter than normal, with eight ranking this February among their 20 wettest on record. Eight major climate sites ranked this February among their 20 wettest on record. Winter precipitation ranged from near normal to 200% of normal for almost all of the Northeast. 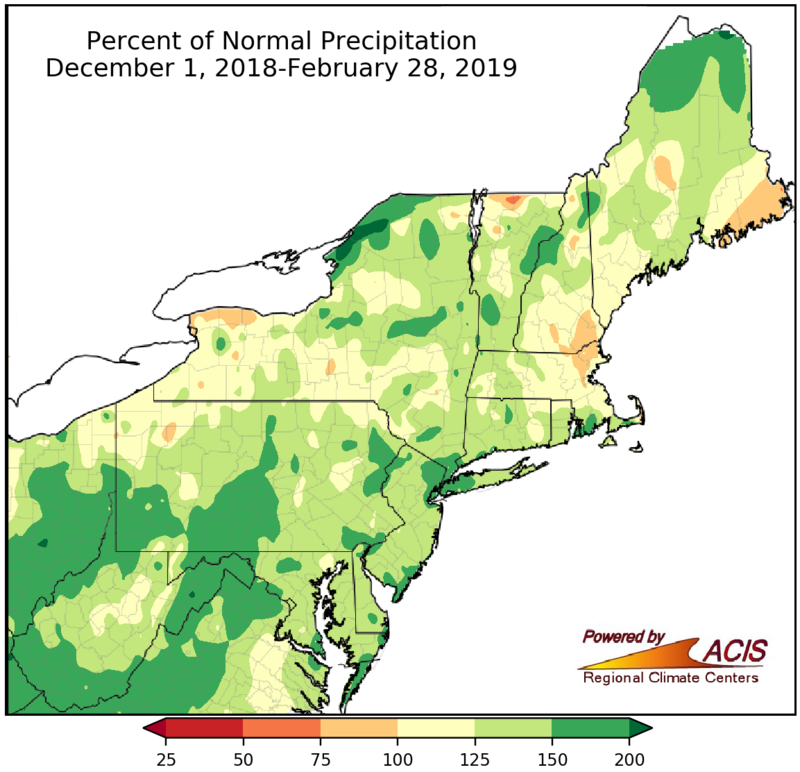 For the winter season, much of the Northeast ended up on the wet side of normal, with precipitation ranging from near normal to 200% of normal. There were a few drier spots, mainly in New England, that received from 75% of normal to near-normal precipitation. 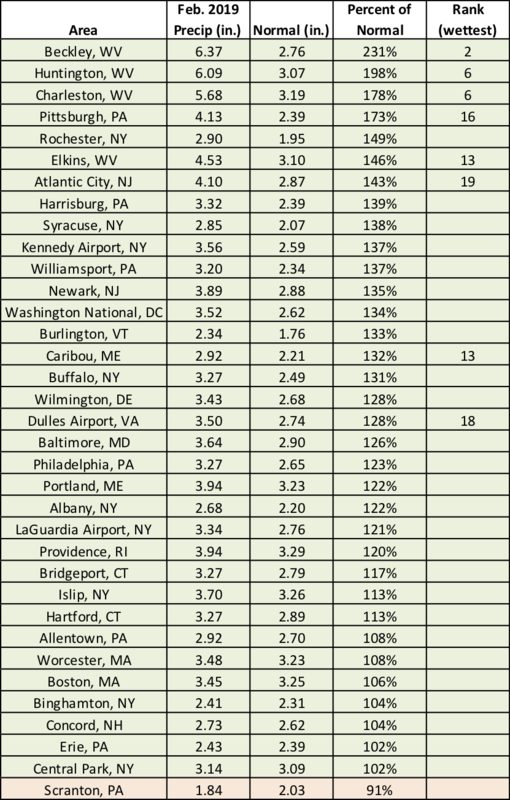 Twenty-six of the 34 wetter-than-normal major climate sites ranked this winter among their 20 wettest on record. Twenty-six major climate sites ranked this winter among their 20 wettest on record. February snowfall ranged from more than 12 inches below normal to more than 12 inches above normal. 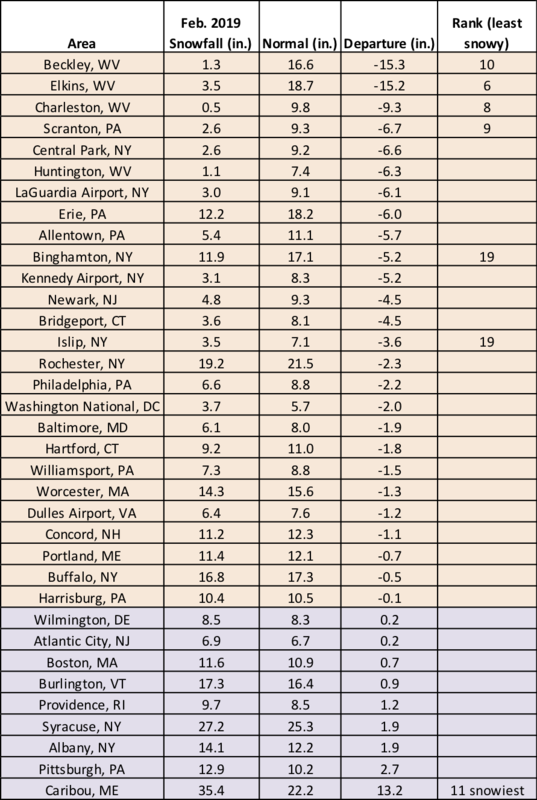 In February, there was some correlation between temperature departure and snowfall departure, with West Virginia being the warmest area and generally having the greatest snowfall deficits (of more than 12 inches) and northern Maine being the coldest area and generally having the largest snowfall surplus (or more than 12 inches). 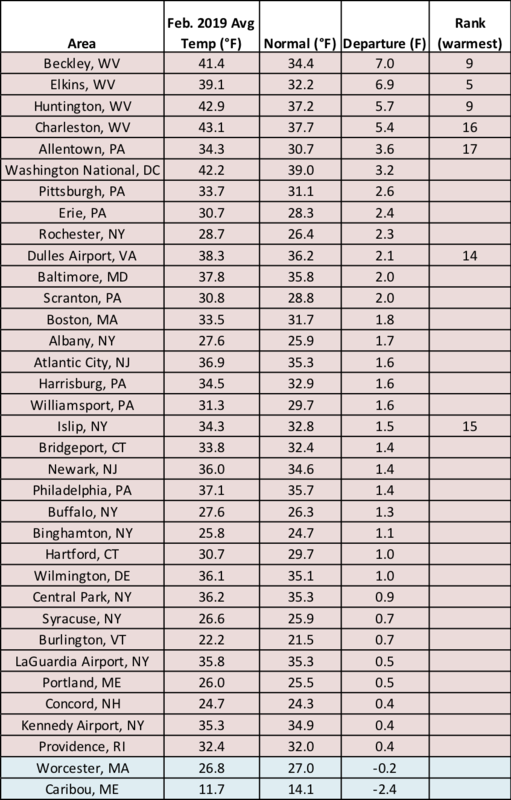 Twenty-six of the region’s 35 major climate sites had a snowfall deficit for February, with six ranking this February among their 20 least snowy. However, Caribou, ME, had its 11th snowiest February on record. February ranked among the 20 least snowy on record for six sites and as the 11th snowiest for Caribou, ME. Winter snowfall ranged from more than 24 inches below normal to more than 24 inches above normal. 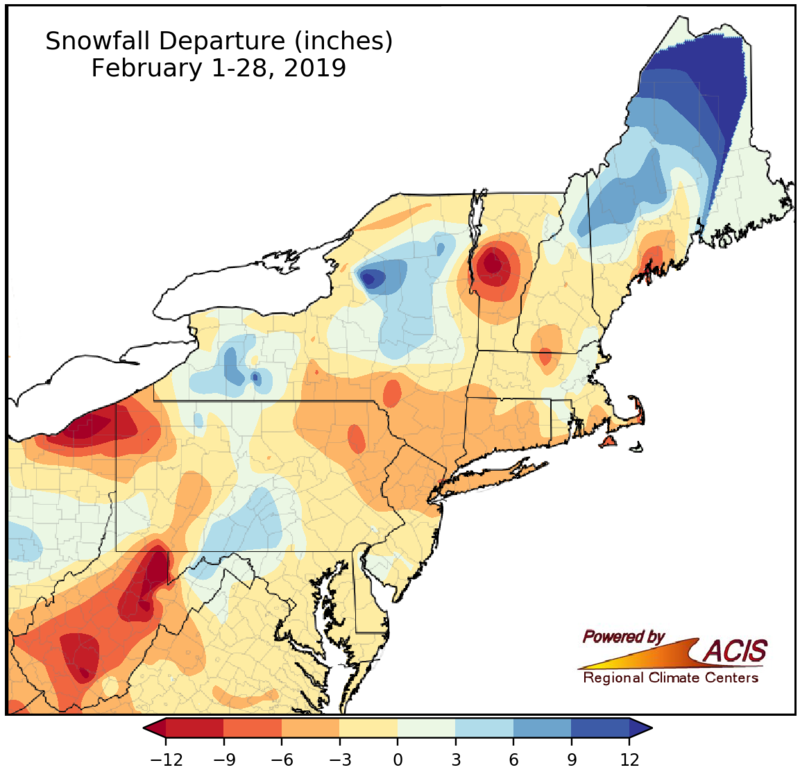 Many parts of the Northeast received less snowfall than normal during winter, with the largest deficits of more than 24 inches in parts of West Virginia, western Maryland, and western Pennsylvania. 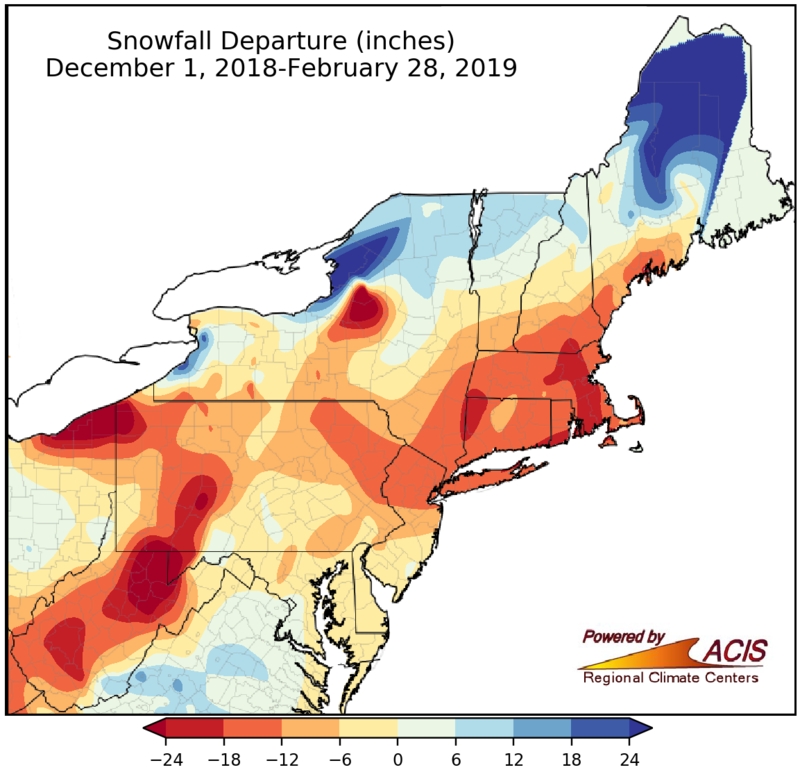 However, northern parts of Maine, Vermont, and New Hampshire, as well as lake-effect areas of New York had a snowfall surplus, with some areas seeing more than 24 inches above normal. 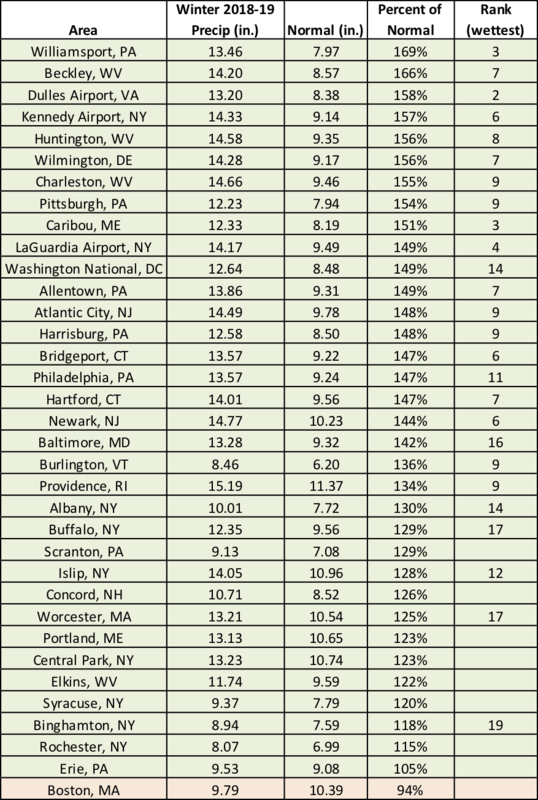 Of the 29 major climate sites that had a snowfall deficit, 11 ranked this winter among their 20 least snowy. However, four of the six snowy sites ranked this winter among their 20 snowiest on record. 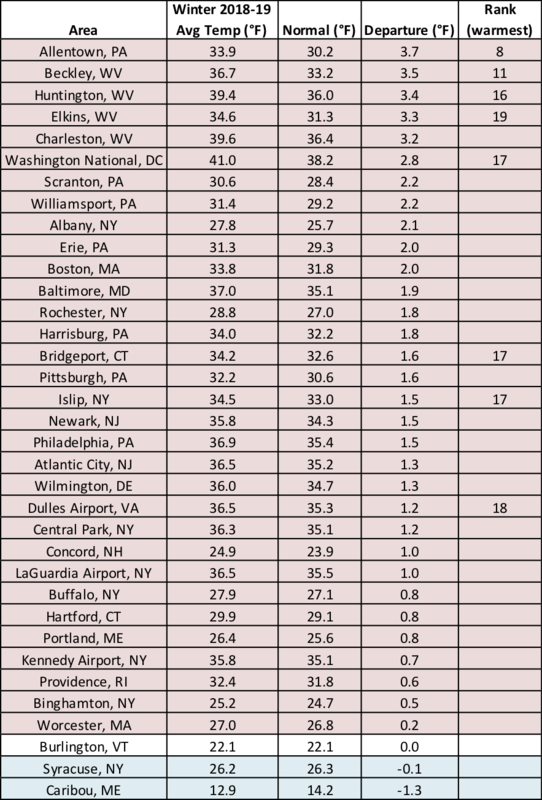 Winter ranked among the 20 least snowy on record for 11 sites and among the 20 snowiest at four sites. Based on the latest outlooks from NOAA’s Climate Prediction Center, March is favored to be cooler than normal for much of the region and wetter than normal for southern and eastern parts of the region. 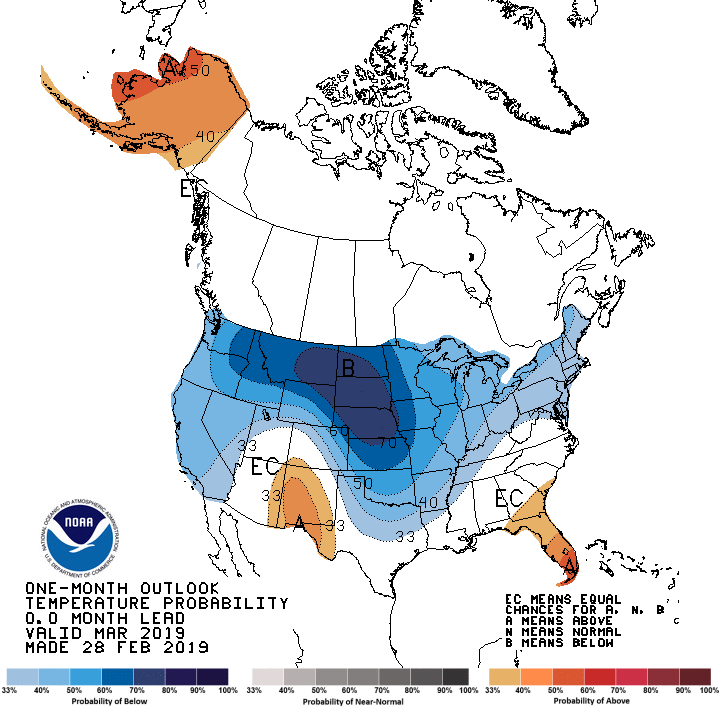 Below-normal temperatures are favored for March in areas shaded blue. 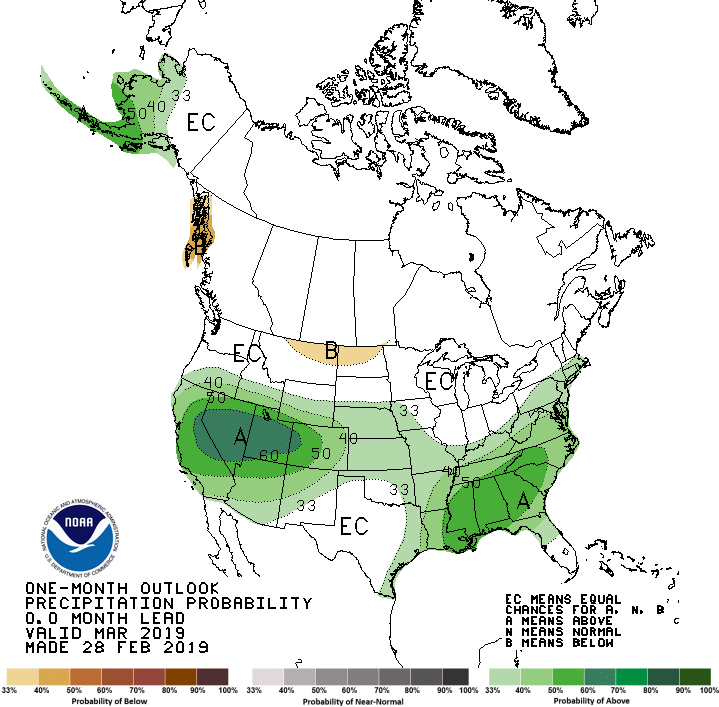 Above-normal precipitation is favored for March in areas shaded green.